The most important piece of equipment for every bird watcher is a good pair of bird watching binoculars. Whether you are watching birds at your bird feeder or hiking along a trail, here are a few things to consider when purchasing bird watching binoculars. The main components of bird watching binoculars are the following: the eyepieces (the end that goes up to the eye), the objective lens (the larger end of the glasses), the prisms (the glass inside the binoculars that receives the light) and the focus wheel (usually between the eyepieces). Bird watching binoculars come with many different numbers attached to them. But, what do all these numbers (i.e. 7×35, 8×42, 10×50) mean? It’s not as complicated as it sounds. The first number (i.e. 7, 8, 10) in the group of numbers is the magnification. All that means is the objects that you are viewing through your bird watching binoculars will be 7x closer, 8x closer, or 10x closer. The choice is yours. For example, you have a pair of 8×42 bird watching binoculars and a bird is perched in a tree 80 feet away. The object will appear 8 times closer (80/8=10ft.). So, it will look like the object is only 10 ft. away from you. Picking the right magnification depends on the way that you will be using your binoculars for birding, but remember that the higher the magnification the steadier you need to hold the binoculars. The second number attached to that group of numbers on your bird watching binoculars is the objective lens diameter. The objective lens is the far lens or larger lens on the binoculars. The objective lens diameter is the size in millimeters (i.e. 35, 42, 50) of the lens. This just simply means that a larger objective lens will let more light into the binoculars. The more light that enters the objective lens, the better the details and the brighter the image. If you are planning to use your bird watching binoculars more towards dusk or in the dark then the 50mm lens will be a better choice. Bird watching binoculars have one of two types of prism designs. The two types are porro and roof prism systems. The porro prism system has a z-shaped optic path. What does this mean to you? Bird watching binoculars employing this system are bigger, bulkier and heavier, probably not a choice if you do alot of walking and hiking to watch birds. On the other hand, a couple of advantages of the porro prism is that they will have a wider field of view and they will cost less. The roof prism system uses prisms that overlap closely, resulting in a slimmer and more compact shape. This makes the roof prism binoculars more lightweight. The drawback with the roof prism is that the field of view will be narrower and they are a more expensive bird watching binocular. Another very important feature to consider when purchasing bird watching binoculars is the ease of focusing the binoculars. With birds constantly in motion, look for a pair of bird watching binoculars that has a quick and sharp focus wheel. Look for the focus mechanism on the binoculars to focus from far to close in one or less revolution. You want your binoculars to feel comfortable in your hands. Remember, it is an individual preference and you should buy the best bird watching binoculars that you can afford. Click The Three Models You Need To Check Out to see a review of binoculars that I recommend. You’re dreaming of starting your first garden bird feeder. You are looking forward to sitting back and enjoying all the beautiful birds that will be attracted to your garden bird feeder. You’re picturing all the beautiful blossoms that the birds will be enjoying. 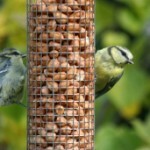 It’s the perfect time of the year to plan a beautiful garden bird feeder. You don’t need a large yard to set-up a beautiful and decorative garden bird feeder. The following facts will leave you with a bird-friendly yard and a natural setting that will be as pleasing to you as it will be for the wild birds. Establish a bird sanctuary in an area that allows a safe landing site for the birds. Allocate a spot for your garden bird feeder near trees or shrubs. Remember, the landscaping doesn’t have to be elaborate. You may already have a place that has shrubs and trees that you can expand on. Birds will use the trees and shrubs for protection from predators. The trees and shrubs will supply the birds with a range of nesting material and nesting sites. Grow a variety of trees and plants that will yield year round food like berries and seeds that will ripen at different times throughout the year. Allow a portion of your manicured grass to grow higher by your garden bird feeder. The higher grass areas provide the birds with an assortment of insects. A variety of plants will supply the best benefits for the birds. Consider adding native and summer fruiting plants close to your garden bird feeder. The food produced by these plants will be well suited for the wild birds that live around you. Birds feed on a variety of insects that are found on the plants. Flowering plants produce seeds which is a favorite food source for finches, sparrows and other songbirds. Wild birds come for the seeds more than the blossoms. Remove plants in your garden bird feeder that are not supplying food in favor of plants that do. Planting flowers is an easy way to attract wild birds to your garden bird feeder. Birds are attracted to your garden bird feeder by numerous types of flowers. Plant flowers that are native to your area. Hummingbirds will be drawn to the garden bird feeder by red flowers. Other birds will come to your garden bird feeder for sunflowers, daisies, zinnias and any other flowers with seeds. This is why it is so important not to cut them down when they are done blooming, it’s the seeds that the birds love. Actually, you can double the number of wild birds attracted to your garden bird feeder by supplying an adjacent water source. A water source will even increase the number of different species of wild birds that will be stopping by for a drink. All species of wild birds will stop at your water station. Otherwise, you would miss the wild birds that are not attracted to the food source that your garden bird feeder is furnishing. A bird bath is one of the easiest ways to entice more wild birds. The bird bath needs to be cleaned and filled with fresh water frequently. Remember, in the winter, the wild birds look for open sources of water. 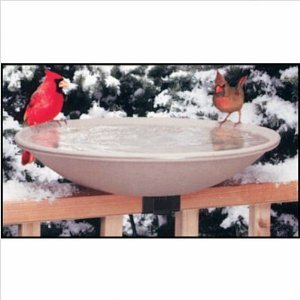 By installing a heater in your bird bath you will be pleasantly surprised at the amount of wild birds flocking to your garden bird feeder in the cold months. If you are creating a natural bird sanctuary you could consider incorporating a small pond as your water source in your garden bird feeder. This sounds like there is so much to do, but don’t be overwhelmed with it. Start with trees, shrubs and plants that your yard already provides. Plan the gradual transition of your garden bird feeder over several planting seasons. It will give you something to look forward to every winter. Plan and plant only the space that you will be able to easily take care of at your garden bird feeder. You will find pleasure in the success of your garden bird feeder knowing that you have built a natural habitat and are helping to protect the environment. 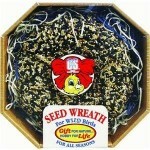 Your careful planning of your garden bird feeder will have you enjoying the sights and sounds of the sweet songbirds. They will enjoy their new habitat and will depend on it in all seasons to come.